A time of fun and merriment. A time for food and beer. A time for spending every free hour in shops buying presents, wrapping presents, putting up Christmas decorations, re-wrapping Christmas presents after the dog’s found the Ferrero Rocher, cleaning the house ready for family visits, cleaning up after family visits…..
Head hung low, my eyes catch sight of the kindling basket. 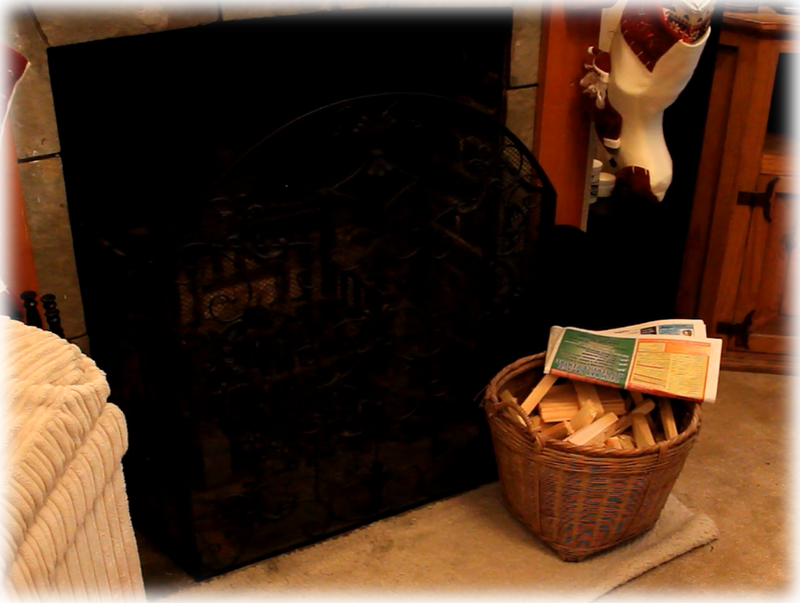 So much dried wood in perfect hand held sizes….. why am I not carving it?! 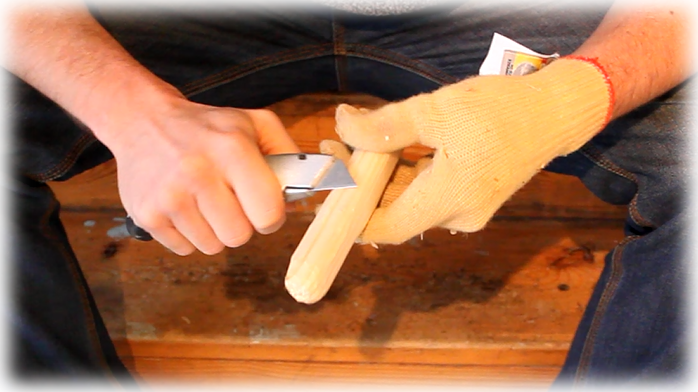 I haven’t whittled for a long time, and since I have limited time to set anything up in the workshop, I can just sit in the kitchen and whittle something quick! I need something simple to carve, something quick and easy. I look around the lounge for inspiration. A gap on the Christmas tree?! Why is there a gap?! I need to fill this space and I need to carve…. I take a seat in the kitchen; chips can be easily swept up and won’t get trodden into the carpet there. I put on my old Kevlar glove to protect my hand from cuts. The last thing I want is to spend the evening clearing blood off the kitchen floor! My Kevlar gloves have no grip which comes back to bite me in the backside, as the wood decides it enjoys the thrill of leaping from my grasp and falling to the floor every 5 minutes! A better glove would have some sort of grip on the palm! 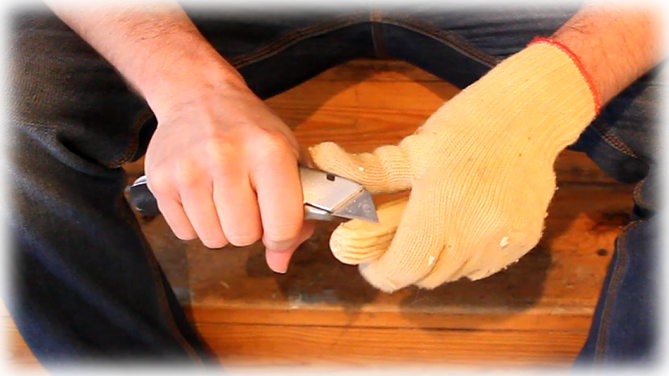 I use a Stanley knife, AKA box cutter, AKA utility knife, with a fixed blade for this project. Cheap, easy to get and sharp! Once happy that the top is circular, and domed to my desired size, I begin roughly shaping the rest of the stick into a cylinder to blend into the top. I can now turn the stick around and begin tapering the entire piece into a point at the opposite end to the dome. 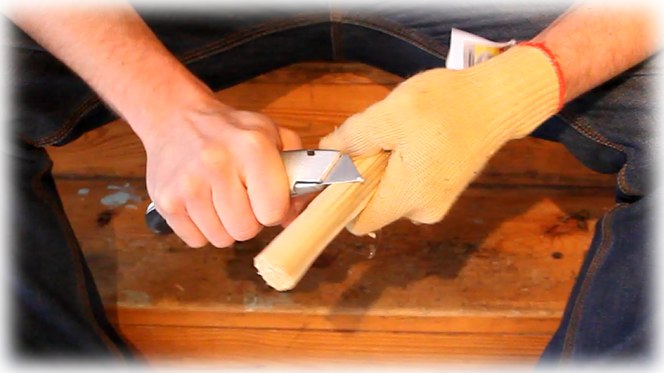 I use a different method here, clasping the stick firmly, and taking long bold swipes to remove wood. I must be fully aware of where that blade is pointing and where it is going, and ensure I’m never in front of it. I have a history of cutting myself, and it’s not fun! 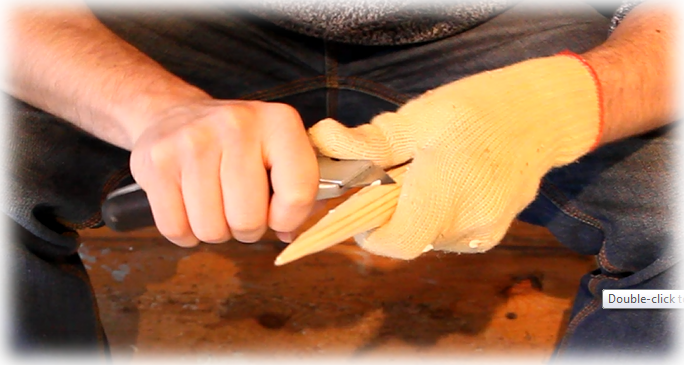 This part of the project is very familiar to me as it’s just like sharpening a very long, thick pencil. Couldn’t be simpler! Now I have my basic cone decoration, I can drill a small hole in the top to allow for it to be hung. 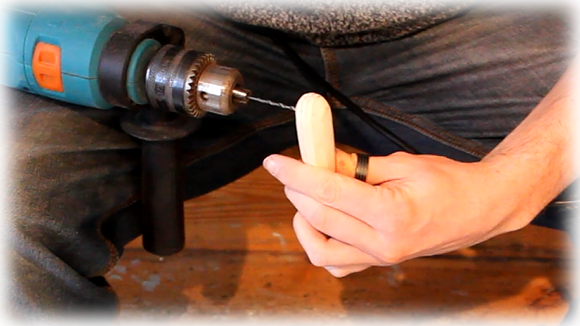 I do this ‘cack handed’, and in hindsight, I should have really drilled down into it, over a sacrificial board. But hey, hindsight is a wonderful thing! The knife is a fairly crude tool, and unless you spend a long time making tiny cuts to create the perfect curves, you should be left with a very choppy, uneven cone. So I simply take 120 grit sandpaper and sand it smooth! I could leave this as a simple cone, but I decide to add a little detail in. 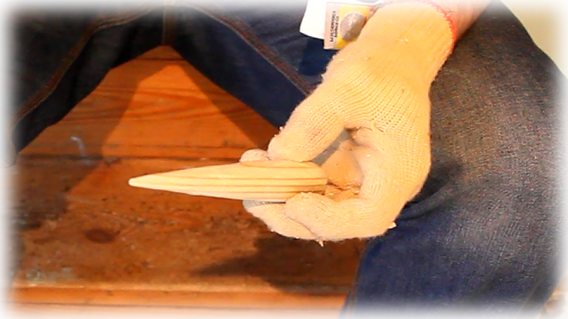 After drawing a spiral around the entire length of the cone as a guide, I pick up my V Tool. 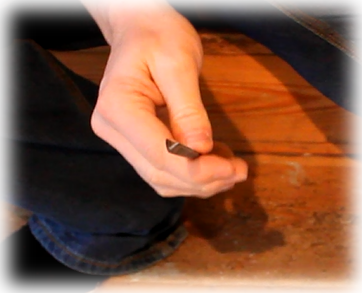 This is a chisel with the cutting edge in the shape of a V. It is a useful tool for many aspects of whittling and carving, but it is not a necessity. 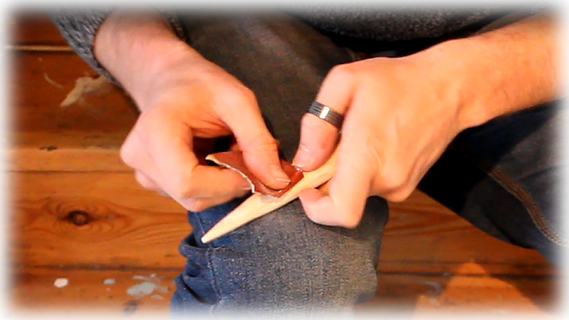 The same groove can be created just the same with just the knife, but it takes twice the amount of time! With my V Tool I carefully follow my guidelines, spiralling around, and down the length of the cone. I take it slow and carefully as the spiral is tight and fiddly, especially at the bottom! My decoration is complete! I do a little final sanding just to correct any little errors, tie on some string, and hit it with a little spray lacquer. The now added string allows for the decoration to be hung as it dries. I apply 3 thin coats of lacquer, lightly sand down to remove dust and debris that has stuck to it as it was drying, then apply a quick final spray to bring the gloss look back and hang it proudly on my tree! 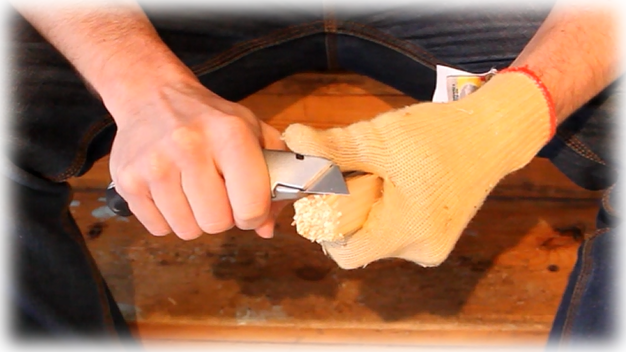 To watch a video of me carving this piece CLICK HERE and watch me on YouTube!